The world took notice when two of the biggest gold nuggets ever discovered were found in Australia last year and G4S was on hand with decades of experience to securely take them on an international tour. 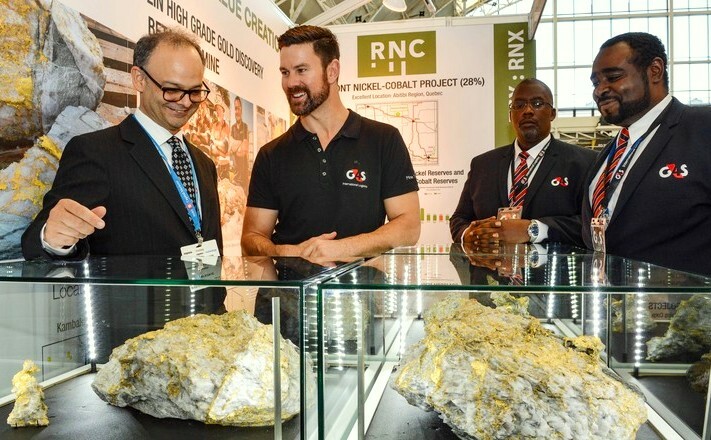 G4S International Logistics (G4Si) at an exhibition showing large gold nuggets. From the touch of King Midas to the legend of El Dorado to the pyramids of Ancient Eqypt, human civilisations have long held an obsession with gold. Highly valuable but notoriously elusive, only 2,500 tonnes of gold are mined around the world each year, usually found in small quantities in the mineral veins inside rocks. Discoveries of large quantities of gold are incredibly rare, so when a single nugget that weighed more than an average man was found in Western Australia in September 2018, the world took notice. Infact, two enormous gold nuggets were found by the mine operator RNC Minerals at the Beta Hunt gold mine; the largest weighing an astonishing 95kg with a combined value of over £4.5 million. People all over the world were keen to get a glimpse of two of the largest gold nuggets ever found, but safely taking such valuable items on tour would be no small task. G4S International Logistics (G4Si) has over three decades of experience and expertise transporting valuable commodities for clients all over the world, including governments, museums, banks and mining companies. The gold nuggets came to the attention of G4Si at an event in Australia in October, who quickly identified the potential to exhibit the nuggets on an international tour. Only a few weeks later, they were securely on display on the other side of the world in London, England, with Canada and the USA next on the list. Angus Whiteman, G4Si Business Development Director, said: “Even as a business accustomed to handling some of the world’s most valuable items and artworks this was a unique operation, and we feel privileged at having played a part in it” said Angus Whiteman, G4Si Business Development Director. The complex project required expertise from across G4S on different continents, including expert handlers to install the exhibitions, security officers to guard the nuggets round-the-clock and couriers to securely transport the nuggets utilising G4S’s fleet of high-security vehicles. G4Si preparing wooden transport crate. “We are very proud to have been chosen as the company of choice to secure and transport such unique items”. The international tour sees the gold nuggets visit Perth, Melbourne, London, Toronto, Ottowa, Tucson and Florida before being flown back to Australia in March to be secured in a G4Si vault.